This week on Bake Off it was Dessert week. I wasn’t keen on making any of the bakes from this week and it was suggested at work that I make éclairs, so that’s what I did! I’ve never made them before, so it was a bit of a challenge but I think they worked out quite well. 1. Preheat the oven to Gas Mark 6/200C/400F. Generously grease a baking tray with butter. 2. Sift the flour onto a sheet of greaseproof paper. 3. Put 120ml of water into a medium-sized pan with the salt and butter and heat gently until the butter has completely melted – don’t let the water boil and begin to evaporate. Quickly bring the mixture to the boil and tip in all the flour in one go. Remove the pan from the heat and beat furiously with a wooden spoon – don’t worry, the mixture will look messy at first but will soon come together to make a smooth heavy dough. 4. Put the pan back on a low heat and beat the dough for about a minute to slightly cook the dough – it should come away from the side of the pan to make a smooth, glossy ball. Tip the dough into a large mixing bowl and leave to cool until tepid. 5. Beat the eggs in a bowl until combined, then gradually beat them into the dough with an electric whisk or mixer or wooden spoon, beating well after each addition. (You may not need all the egg.) The dough should be very shiny and paste-like, and fall from a spoon when lightly shaken. 6. Spoon the pastry into a piping bag fitted with a 1.25cm plain nozzle and pipe 12 10cm/4″ lengths onto the greased baking tray. 7. Sprinkle the tray, not the pastry, with a few drops of water, and bake in the oven for 15 minutes. Then, without opening the door, reduce the oven temperature to Gas Mark 3/170C/325F and bake for 10 minutes, or until golden brown and crisp. 8. 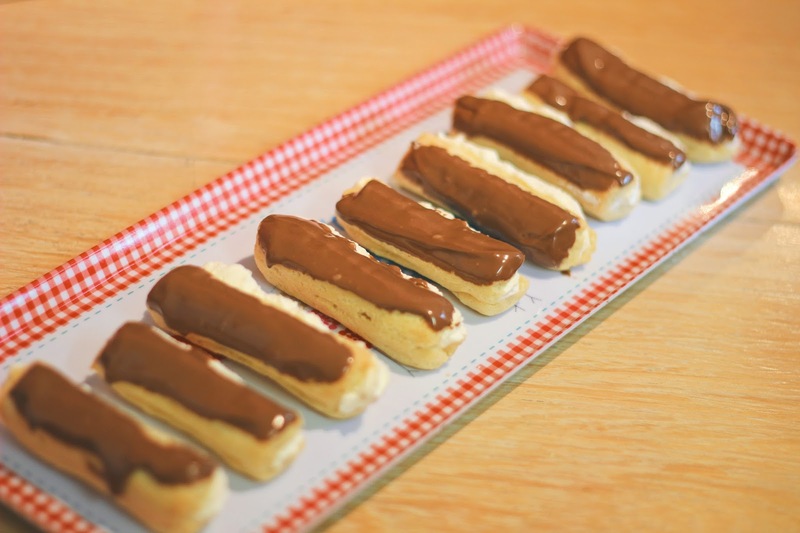 Remove the tray from the oven and carefully make a small hole in the side of each éclair to allow steam to escape. Return to the oven and bake for a further five minutes, or until the pastry is completely crisp. Remove from the oven and transfer to a wire rack to cool. 9. For the filling, whip the cream with the sugar and vanilla extract in a bowl until just stiff. 10. Once the éclairs have cooled, cut down the length of one side of each éclair and pipe in the whipped cream. 11. Melt the chocolate and allow it to cool slightly. 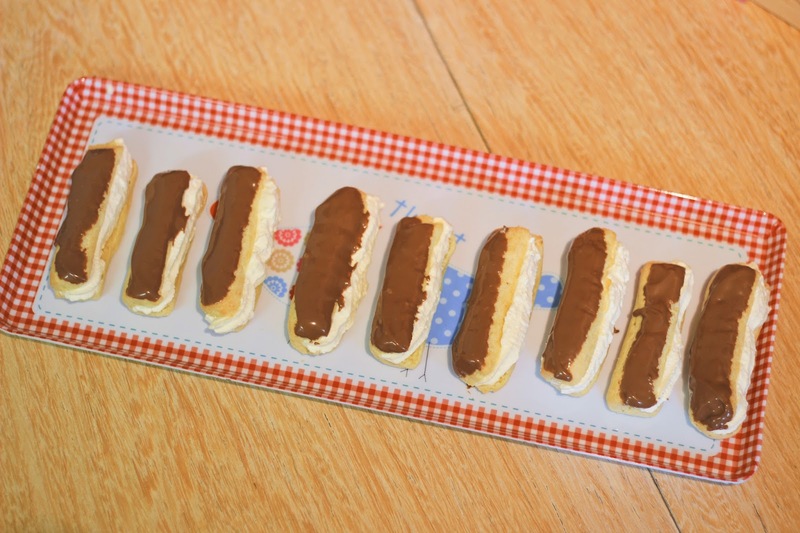 Dip the tops of the éclairs in the chocolate and let the chocolate set before serving. 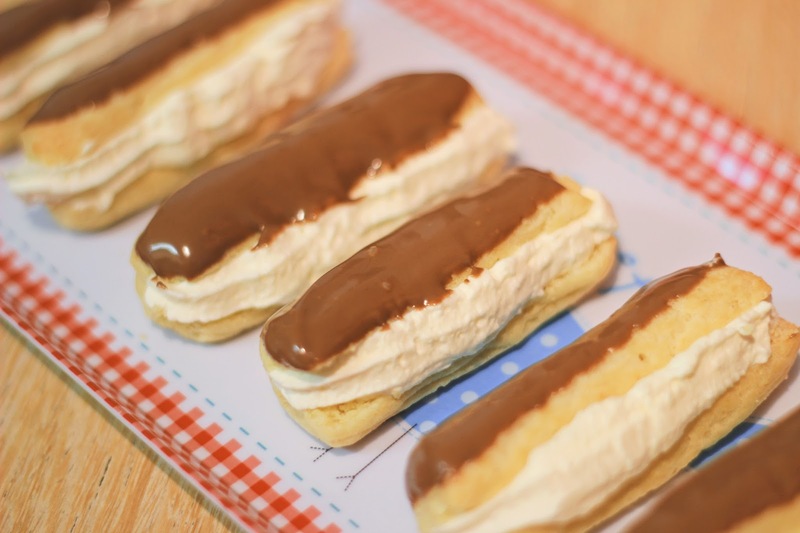 Have you ever made éclairs?